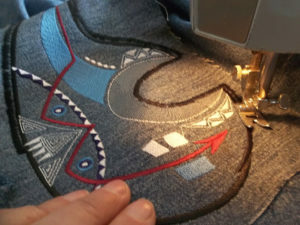 Sewing your bear applique to your shirt or jacket really doesn't require anything more than basic sewing skills on the average home sewing machine. A simple straight stitch to outline parts of the bear and a tightly sewn zig zag stitch on the outer edge of the bear and that's it. 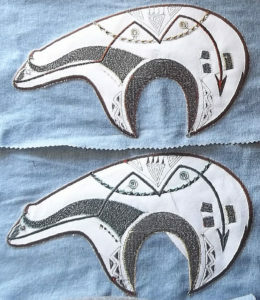 These Zuni Bear Embroidered Applique Patches, while large, are not overly so. They are about 5.50 inches tall by 10.75 inches wide. When you receive your applique, the backside will look something like this…. 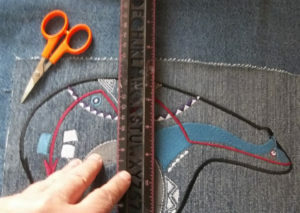 position my work, and reposition several times if needed before I begin sewing. make your sure that your patch is perfectly centered. Don't forget to position it in the other direction as well !! I am just measuring at the 'nose' to make double darn sure I've got it centered. 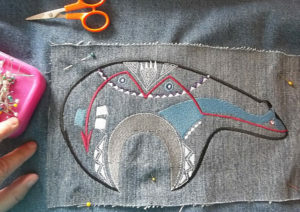 I am comfortable sewing without the added measure of pinning the applique in place. 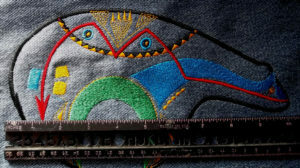 If you are not, feel free to pin to make SURE the applique remains securely in place. To anchor your patch by sewing, there are several sewing points you can choose. 1. 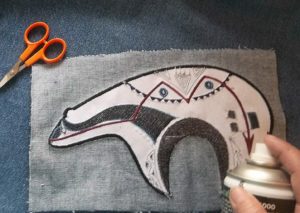 The outside edge of the bear will be sewn in a dense zig zag stich. You can sew just in the inside as well with a matching color, but it's not necessary. 2. Sew in a matching color the topside area of the arrow. This image shows a red arrow. 3. You can also sew on the outside edge of the neck (blue) on the top. 4. In a matching color, sew the top outside edge of the inverted 'U'. In this manner your bear will be secure to the garment before zig zagging the outer area. 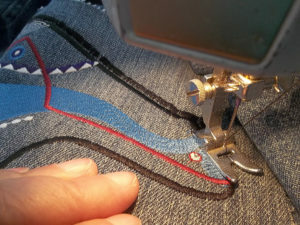 Set your zig zag stitch to the width and length you like. 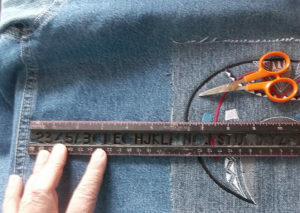 I have my stitch set at the widest point and as close as possible together. 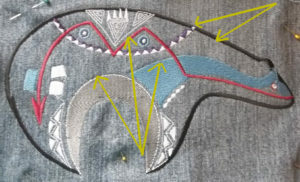 Continue around the bear stitching as close as possible to the original outline stitch. 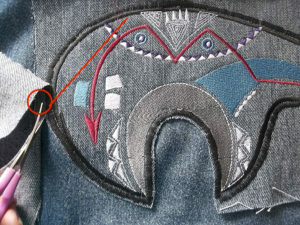 Cut as close as possible to the sig zag sitch you just sewed near the zuni bear, taking care to not cut a hole in the underlying garment. 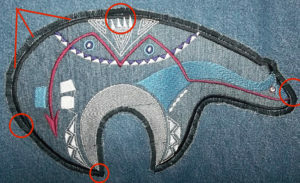 The areas within the round circles show the best stitching…the zig zag stitch is close to the original stitched edge and the stitches are tight. Then…..I got in a hurry. I still am learning patience, even at my age. 🙂 I have the deplorable tendency to either push my material in from the front to try to feed It in faster, or I tug from the back trying to pull the material through the feed feet faster. This not only will eventually drag your machine out of time, it will give you uneven stitches just like it did here for me. The corner at the bottom left shows how nice my sitches could have been, had I been patient enough to the let my machine do it's work without me pushing and pulling ….Oh well…it just meant I had to go over it again to give it that nice smooth look. The second time I got the results I wanted and it looked terrific on the back on my denim shirt. 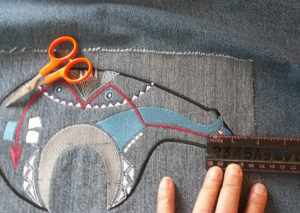 If you like the rugged, frayed look, then leave it like it is, trim not quite as close to the edge and after the first wash, your applique patch will have a cute, exaggerated well-worn and best-loved look. Have fun!